For an introduction to the Seven Sundays devotion to St Joseph, click here. sitting in the midst of the doctors. of losing Jesus through mortal sin. Each year his parents went to Jerusalem for the feast of Passover, and when he was twelve years old, they went up according to festival custom. After they had completed its days, as they were returning, the boy Jesus remained behind in Jerusalem, but his parents did not know it. Thinking that he was in the caravan, they journeyed for a day and looked for him among their relatives and acquaintances,but not finding him, they returned to Jerusalem to look for him. And he said to them, “Why were you looking for me? Did you not know that I must be in my Father’s house?” But they did not understand what he said to them. you chose Joseph to be the husband of Mary, the mother of your Son. As we enjoy his protection on earth, may we have the help of his prayers in heaven. was troubled by your fear of Archelaus. and, like you, may die in their company. “Work was the daily expression of love in the life of the family of Nazareth. The Gospel specifies the kind of work Joseph did in order to support his family: he was a carpenter. This simple word sums up Joseph’s entire life. For Jesus, these were hidden years, the years to which Luke refers after recounting the episode that occurred in the Temple: ‘And he went down with them and came to Nazareth, and was obedient to them’ (Luke 2:51). This ‘submission’ or obedience of Jesus in the house of Nazareth should be understood as a sharing in the work of Joseph. Having learned the work of his presumed father, he was known as the ‘the carpenter’s son.’ If the Family of Nazareth is an example and model for human families, in the order of salvation and holiness, so , too, by analogy, is Jesus’ work at the side of Joseph the carpenter. In our own day, the Church has emphasized this by instituting the liturgical memorial of St Joseph the Worker on May 1. Human work, and especially manual labor, receives special prominence in the Gospel. Along with the humanity of the Son of God, work, too, has been taken up in the mystery of the Incarnation, and has also been redeemed in a special way. At the workbench where he plied his trade together with Jesus, Joseph brought human work closer to the mystery of the Redemption. especially during the flight into Egypt! to have God himself always near you. especially the help we need to flee from dangerous situations. and for them alone may we live and happily die. “Herod learned from the magi, who came from the East, about the birth of the ‘king of the Jews’ (Matthew 2:2). And wehn the magi departed, he ‘sent and killed all the male children in Bethlehem and in all that region who were two years old or under’ (Mt 2:16). By killing them all, he wished to kill the newborn ‘king of the Jews,’ whom he had heard about. His sorrow when he heard the prophecy of Simeon; his joy when he learned that many would be saved through the sufferings of Jesus. that would be attained by countless souls. are predestined to a glorious resurrection. “This rite, to which Luke refers, includes the ransom of the firstborn and sheds light on the subsequent stay of Jesus in the Temple at the age of twelve. “The ransoming of the firstborn is another obligation of the father, and it is fulfilled by Joseph. Represented in the firstborn is the people of the covenant, ransomed from slavery in order to belong to God. Here, too, Jesus – who is the true ‘price’ of reansom (cf. 1 Cor 6:20; 7;23; 1 Peter 1:9) – not only ‘fulfills’ the Old Testament rite, but at the same time transcends it, since he is not a subject to be redeemed, but the very author of redemption. “The gospel writer notes that ‘his father and his mother marveled at what was said about him ‘ (Luke 2:23), in particular at what Simeon said in his canticle to God, when he referred to Jesus as the ‘salvation which you have prepared in the presence of all peoples, a light for revelation to the Gentiles, and for glory to your people Israel’ and as a ‘sign that is spoken against’ (cf. Luke 2:30-34). “‘It pleased God, in his goodness and wisdom to reveal himself and to make known the mystery of his will (cf. Ephesians 1:9). His Will was that all should have access to the Father, through Christ, the Word made flesh, in the Holy Spirit, and, thus become sharers in the divine nature (cf. Ephesians 2:18; 2 Peter 1:4)’. and filled you with quiet joy. “A son’s circumcision was the first religious obligation of a father, and with this ceremony Joseph exercised his right and duty with regard to Jesus. The principle that holds that all the rites of the Old Testament are a shadow of the reality (Hebrews 9:9 f., 10:1) serves to explain why Jesus would accept them. As with all the other rites, circumcision, too, is ‘fulfilled’ in Jesus. God’s covenant with Abraham, of which circumcision was the sign (cf. Genesis 17:13), reaches its full effect and perfect realization in Jesus, who is the ‘yes’ of all the ancient promises (cf 2 Corinthians 1:20). O most blessed patriarch, glorious Saint Joseph, who were chosen to be the foster father of the Word made flesh, your sorrow at seeing the child Jesus born in such poverty was suddenly changed into heavenly exultation when you heard the angelic hmn and beheld the glories of that resplendent night. By this sorrow and this joy, we implore you to obtain for us the grace to pass over from life’s pathway to hear angelic songs of praise and to rejoice in the shining splendor of celestial glory. In those days a decree went out from Caesar Augustus 2 that the whole world should be enrolled. This was the first enrollment, when Quirinius was governor of Syria. So all went to be enrolled, each to his own town. And Joseph too went up from Galilee from the town of Nazareth to Judea, to the city of David that is called Bethlehem, because he was of the house and family of David,to be enrolled with Mary, his betrothed, who was with child. While they were there, the time came for her to have her child,and she gave birth to her firstborn son. 3 She wrapped him in swaddling clothes and laid him in a manger, because there was no room for them in the inn. So they went in haste and found Mary and Joseph, and the infant lying in the manger. When they saw this, they made known the message that had been told them about this child. All who heard it were amazed by what had been told them by the shepherds. And Mary kept all these things, reflecting on them in her heart. Then the shepherds returned, glorifying and praising God for all they had heard and seen, just as it had been told to them. As guardian of the mystery hidden for ages in the mind of God, which begins to unfold before his eyes ‘in the fullness of time,” Joseph, together with Mary, is a privileged witness to the birth of the Son of God into the world on Christmas night in Bethlehem. Joseph was an eyewitness to this birth, which took place in conditions that, humanly speaking, were embarrassing – a first announcement of ‘self-emptying’ (Phil 2:5-8) that Christ freely accepted for the forgiveness of sins. Joseph also witnessed the adoration of the shepherds, who arrived at Jesus’ birthplace after the angels had brought the m the great and happy news. Later he also witnessed homage of the magi who came from the east (Matthew 2:11). O chaste spouse of Mary, great was the trouble and anguish of your heart when you were considering quietly sending away your inviolate spouse; yet your joy was unspeakable, when the surpassing mystery of the Incarnation was made known to you by the angel. By this sorrow and this joy, we beseech you to comfort our souls, both now and in the sorrows of our final hour, with the joy of a good life and a holy death after the pattern of your own life and the death in the arms of Jesus and Mary. “In the words of the ‘annunciation’ by night, Joseph not only heard the divine truth concerning his wife’s indescribable vocation; he also heard once again the truth about his own vocation. 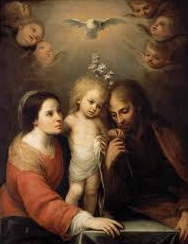 This ‘just’ man, who, in the spirit of the noblest traditions of the Chosen People, loved the Virgin of Nazareth and was bound to her by a husband’s love, was once again called by God to this love. So tomorrow i join all you Sisters and Brothers in this novena. I pray for peaceful elections in my country Uganda (Feb. 13th), i pray that the unemployed may be blessed with profitable employment (i specifically lift up my sister Sharon, my friends Stephen and Samuel), and all the unemployed around the world, I pray that i may be able to obtain the piece of land am trying to pay of for, and that the Lord may provide finances to have a home built. Peace in the whole world. 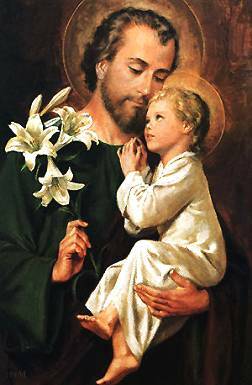 Saint Joseph, please deliver my petitions to your (adopted) Son Jesus. Sr, When I was making my 8 day retreat last Oct, I felt like Blessed Mother was telling me that I’d “do well to get to know St Joseph better”, so I adopted him for my patron for 2011. This novena fits right into that & I’m grateful for it. Thx!